Goa Lawah Temple located in Klungkung regency, on the side of the highway to the port of Padang Bai, 3 km to the east of the Kusamba beach. Klungkung at the seaside, which is the largest producer of sea salt in Bali. Because the sea water in the Goa Lawah Temple, has the highest salt content in Bali. 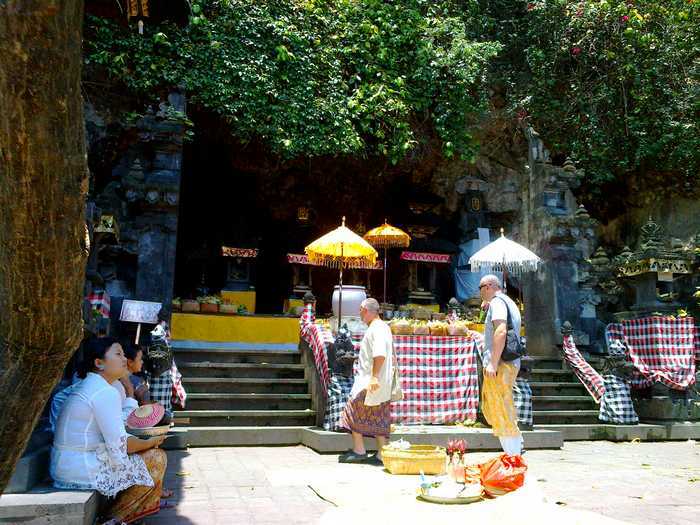 Goa Lawah Temple is one of the temples in Bali which has a significant meaning for Balinese Hindus. Because when Balinese cremation ceremony finished, they should pray in this temple. As at the time of my grandmother's cremation ceremony. After my grandmother's body cremated, and his ashes taken to the sea, then we pray to the great pretend in Bali, Goa Lawah Temple this one. Goa Lawah Temple, is a temple located in a cave. Cave inhabited by bats (Lawah = bat). Bats are very numerous and are always out and go into the cave. The sound is very noisy bats is characteristic of the temple. Almost every day Balinese Hindus, there came to the Goa Lawah Temple. Sometimes on certain days a lot of people who came. They come from different districts of Bali, to perform cremation ceremonies related activities that they do. The air condition in the Goa Lawah Temple very hot. Since it is a coastal area. But we can enjoy the fresh air in the temple area has a great abundance of trees and shade. In the temple area there is also a large hall that can be utilized for shelter and rest. If we feel hungry, do not worry, there are plenty of stalls selling food at area Goa Lawah Temple. Many sellers also cold drinks, and the most interesting is the vending of young coconuts.